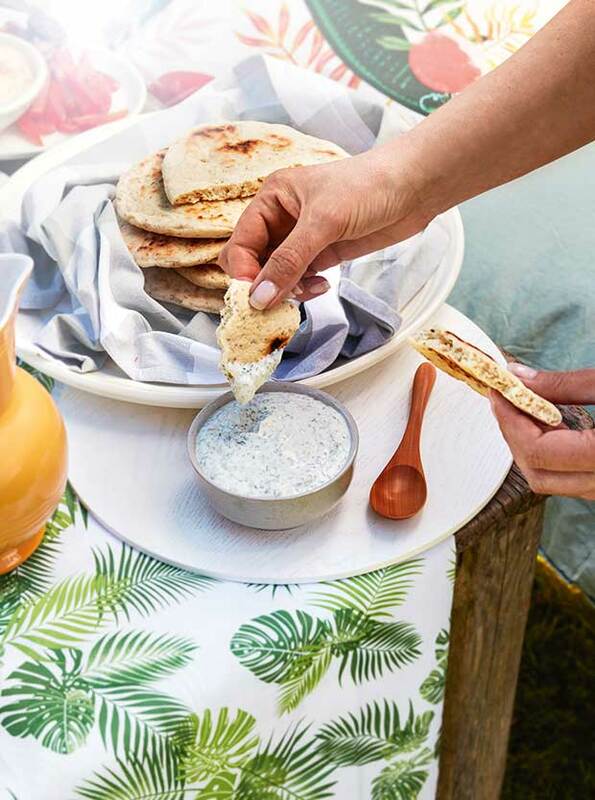 Add some Mediterranean spice to your summer barbecue with homemade flatbreads and yoghurt dip. In the bowl of an electric mixer whisk together the water, yeast and sugar until yeast is dissolved. Whisk in half the flour. Cover and leave in a warm place for 10 to 20 minutes or until mixture begins to bubble. Return bowl to mixer fitted with dough hook. Start the machine and gradually add the remaining flour, rosemary and salt. Continue mixing for 10 minutes after the last addition or until the dough feels slightly tacky and is smooth in appearance. Lightly oil a large bowl, then add the dough. Turn it over so it is lightly coated in oil, then cover the bowl and leave in a warm place for 35 to 60 minutes or until dough has doubled in size. Gently push a finger into the dough. If it’s ready, the indentation from the finger will remain there. If it’s not, the dough will bounce back.